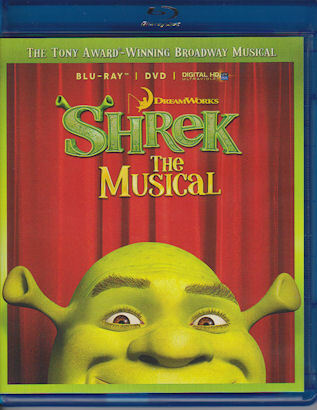 This BluRay edition of Shrek The Musical is one of the latest examples of the relatively new trend of carefully filming Broadway musicals and releasing them on video, rather than adapting them to film and losing most of the original performers in the process. In this video you get the original cast, including Brian D’Arcy James as Shrek, Sutton Foster as Princess Fiona, Daniel Breaker as Donkey, Christopher Sieber as Lord Farquaad, and John Tartaglia as Pinocchio. I’m going to state right up front I’ve never cared that much for titles that include “The Whatever,” though I suppose it’s justified here in that, first, this is a musical, and the animated feature wasn’t, and, secondly, it helps tell them apart. Sometimes you’re just stuck with that sort of thing. Anyway, this is a lovely production and, really, can we ever get enough of Sutton Foster dancing and singing? Let’s do the negatives first. This is high definition BluRay, and that isn’t particularly kind to stage makeup, which is intended to look good from a distance, not close up. So Shrek’s ear vents, which would be difficult to see from a few rows back in the audience, are fairly obvious, and Fiona and Farquaad both look a bit garish at times. So, okay, this is what you get when you record (mostly) actual live performances, and while sometimes you notice it, most of the time you don’t, really, and you can just settle back and enjoy the show. A few cutaway shots, recorded without an audience, such as some of Fiona’s transitions, are obvious only because there wouldn’t be time to do the elaborate ogress makeup, and the stage expedient of using green lights, or a pullover mask and wig, are too obvious on video. Daniel Breaker does a good bit of not entirely unexpected scene stealing as Donkey. There’s probably no way to do that part without it. Sutton Foster is, well, Sutton Foster.